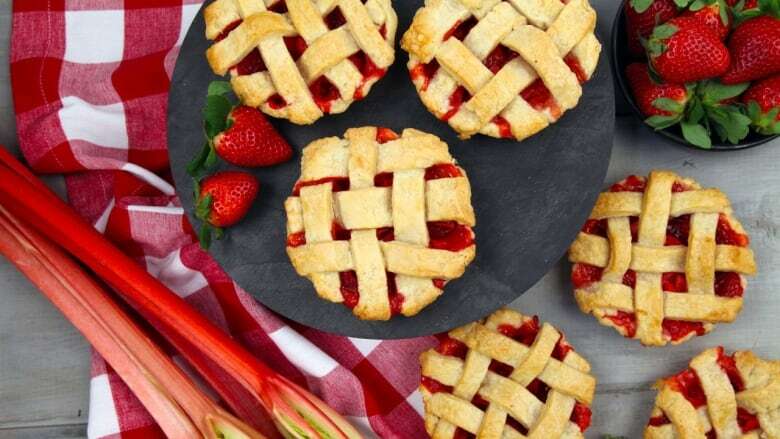 Shahir’s Strawberry Rhubarb Tarts are the perfect spring dessert. Frozen fruit will suffice but if you can find fresh rhubarb, we highly recommend it. Place the chilled flour, salt, and sugar in the bowl of a food processor fitted with a steel blade and pulse a few times to combine. Add the butter and shortening. Pulse 8 to 12 times, until the butter is the size of peas. With the machine running, pour the ice water down the feed tube and pulse the machine until the dough begins to form a ball. Dump out on a floured board and divide in half. Roll dough into 2 balls. Wrap in plastic wrap and refrigerate for at least 30 minutes, or overnight. Preheat oven to 400F, and spray 6 mini tart pans with cooking spray. Roll out dough to ⅛" thick and line prepared tart shells with dough, pressing into the bottom and using a rolling pin to cut off the edges. Chill the tart shells in freezer for 15 minutes. Cover tarts with parchment paper and fill ⅔ with dried beans or rice. Blind bake tart shells for 15-20 minutes, until just golden brown. Remove from oven and set aside to cool. In a large bowl, toss together all ingredients for filling, divide evenly between tart shells. Return to the oven and bake until fruit looks thickened and jammy, 20-25 minutes. Remove from oven, cool and serve with whipped cream.